Going all-in on asymmetrical, 4v1 multiplayer has always been a gamble. For every breakout success like Dead by Daylight, you get a big-budget flop like Evolve, or the ill-fated Fable Legends, which got abruptly cancelled after making it all the way to public beta testing. BioWare's Shadow Realms was another 4v1 game that got the axe well after it had been shown off - but from its ashes rises Breach, a far more vibrant take on the asymmetrical structure. This third-person action RPG is being developed by QC Games, a studio founded by folks who left BioWare and EA to see their idea actually make it to market this time. On top of its cool character designs and colorful presentation, Breach has some aces up its sleeve to help it survive the risky format that is asymmetrical multiplayer: it's doing a little bit of everything with its class designs, and it doesn't actually need to be played like a 4v1 game. Breach's framework will feel comfortably familiar if you've ever played any of the new-school MMOs that emphasize active combat. If you're playing as one of the four heroes, you'll come equipped with a flashy dodge move, two weapon-specific attacks, three special abilities, and one ultimate all based on your chosen class. You'll need to aim your abilities and focus on positioning to avoid enemy attacks, which are clearly telegraphed by red indicators that dot the affected areas. While the gameplay is akin to MMOs like Guild Wars 2 or TERA, the premise echoes the spooky, supernatural conspiracy theories of The Secret World. Reality as we know it is starting to meld with the mythological world, following the collapse of a 70,000-year-old magical bulwark known as The Veil. Now, all manner of legendary monsters and the cultists who worship them are wreaking havoc around the titular Breach locations that have sprung up in places like Japan and Egypt, and it's your job to keep these dark forces at bay. There are currently six maps that serve as your paranormal battlegrounds, like a version of Tokyo that melds city streets and ancient forests, or a chaotic voyage through the many chambers inside the Great Pyramid of Giza. Everything about Breach's look pops in a way that Shadow Realms really didn't, from its exotic selection of monsters running amok in visually arresting areas, to the stylish duds modeled by the myriad character classes. QC Games (named after the Aztec deity Quetzalcoatl, reinforcing the studio's fascination with all things supernatural) has positioned itself as a midsize team that sits somewhere between small indie and full-on AAA, giving Breach the same scrappy appeal as other free-to-play games like Path of Exile or Warframe. "The goal is to create a different, fresh experience, not do another one of a game that's out there," says Breach's game director Gabe Amatangelo. "That's part of the reason why we left EA. We'd been doing a lot of these major games, and we'd been doing a lot of 'What's the market? What's the trend? What made the most money recently? Ok, let's do that one!' We're kinda tired of doing that; we want to offer something new to the industry, to help grow the industry." Calling Breach entirely "new" would be inaccurate, thanks to the large selection of hero classes that liberally borrow or iterate on archetypes you might've played before. "It's sort of like the Super Smash Bros. of classes," laughs Amatangelo. "I take gameplay loops from a bunch of different things. If you're a huge shooter fan, and I just like Prot Pally in WoW [i.e. the Protection Paladin tanking spec in World of Warcraft], I'm going to play a Mana Warrior, you're going to play the Gunslinger, and we'll be able to play this game together. As an independent company, I can shamelessly say things like 'Prot Paladin rip-off,' or 'Dante from Devil May Cry rip-off.'" Breach makes no attempt to hide its inspirations; the Auros Gladiator class has exact copies of Dante's signature High Time launcher attack and sword-spinning Prop Shredder. In some cases, Amatangelo can even pull a class' blueprints from his own portfolio. "There are a lot of great ideas out there, and it's all about building on them," he says. "One of our upcoming classes is something inspired by one of the first games I worked on, Warhammer Online, so I've got a shameless rip-off of one of the classes I worked on over there." What's intriguing about Breach's class designs borrowing from other games is that anything you know and love elsewhere could be possible here. I've always been fascinated with unconventional RPG classes, and Breach's willingness to effectively resurrect interesting ideas from now-defunct MMOs makes for an interesting selling point. Between matches, your character hangs out in the Library of Alexandria with up to 29 other players (think Destiny's Tower, but with a supremely cool pool that seems to contain the entire cosmos). Here, you can switch between the classes you own at will, specializing your build further with ability-modifying gems. 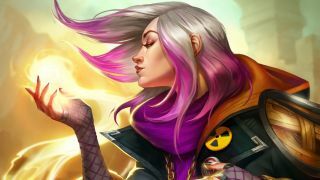 Classes are set up like heroes in MOBAs: they've got a distinct set of skills, and over time, you can amass a growing collection by buying classes with real money or earning them in-game. Then there's the Veil Demon, that 'one' part of the 4v1 setup who stands in the way of the heroes reaching and killing the boss of each map. Every round of Breach is set up with four heroes fighting against one Veil Demon, but AI bots will jump in to fill any vacant spots, much like Left 4 Dead. Heroes must fight through seven rooms with unique objectives (like capturing nodes, escorting drones, or clearing out all the enemies before a timer expires), while the Veil Demon is working to mess with the heroes by possessing enemies and deploying various traps in the hopes of eventually wiping out the whole party. Much like Heroes of the Storm, heroes share XP for killing monsters and completing objectives, which lets you upgrade your abilities mid-match the more you level up. I wrote a while back about how it once seemed impossible for anyone to enjoy being the lone enemy in the 4v1 format - so I was pleasantly surprised at how much fun as I was having while playing as the Veil Demon. It certainly helps being in the same room as your opponents, hollering and trash-talking as you sabotage the heroes every step of the way, but there's never a dull moment as the Veil Demon. In your regular floating form, you can roam freely and quickly around the map, laying down traps (I used a combination of poisonous mushrooms, lava pits, and tree-root cages) to effectively troll the heroes, then possessing enemies to coordinate their attacks, or spawning in a mini-boss style Elite monster (which can also be possessed, of course). The map layouts are always the same, so over time you can figure out the best spots to set up shop and plan an ambush, much like Left 4 Dead or Rainbow Six Siege. The Veil Demon even has six exclusive classes all their own (though they all manifest as a drab cloud of black smoke). And what's nice is that Breach seems like it'd be just as fun if you want to play as four heroes versus an AI Veil Demon, or beat on a team of hapless hero bots as a Veil Demon yourself. "Our [current playtest] stats are 45% Veil demon wins, 55% hero wins, so we're in a pretty good place," says Amatangelo. "But it really depends on what players want. If we get this out in front of players and they say 'We really love co-op and high difficulty modes,' and it's all AI Veil Demons, then sure, we'll lean into that. If people are like 'Oh, I really want to know my rank,' then sure, we'll introduce a ranked mode." Breach is currently in alpha testing on PC, and is gearing up for Steam Early Access later this year; console versions seem likely, but it's way too soon to say if and when. And from what I've played so far, it definitely feels like a contender in the 4v1 space thanks to its diverse classes, fetching aesthetic, and bestiary of mythical monsters. With so many classes and variables to choose from, you'd think Breach would be a nightmare to balance, but Amatangelo isn't too worried about it. "Players are going to find the overpowered combinations, then someone else will find an overpowered combination, and the overpowered combinations are going to match against each other! It's a self-balancing system as long as you give players the tools, and that's the key," he says. "If you try to force them, that's where the systems break. I don't want to talk trash about [any specific 4v1 games], but you can see that mistake has been made a number of times." While you wait for Breach's eventual free-to-play launch next year, check out our curated, up-to-date list of the 25 best free games to play right now.